When a natural or man-made biological event occurs, a rapid response is imperative—from initial organism capture and detection to identification to genomic characterization of the agent for medical relevant features including virulence and antibiotic resistance. Each of these steps are benefitting from significant technological improvement that can save lives. Yet technological innovation alone is not sufficient to make a difference. These new technologies must be validated and approved for use in order to have a practical impact. That means the government approval process must operate efficiently and on pace with an ever-accelerating technology development cycle. This presents a challenge to both industry and government. On the one hand, industry is challenged with providing high-quality test and evaluation data necessary to achieve safety and efficacy approvals. On the other hand, government is challenged with speeding the procurement and approval processes while also accepting a level of risk that always accompanies considerable technology leaps. Recent open-source intelligence agency reports paint a disturbing picture of terrorists intent on developing biological weapons. James Clapper, the U.S. director of national intelligence, said that because biological materials are used for peaceful as well as bad intent, they flow freely throughout the economy. So terrorists have easier access to biological materials than they would to other types of weapons of mass destruction, such as nuclear devices. “The time when only a few states had access to the most dangerous technologies is past,” Clapper told Congress last year. To counter the threats posed by natural and man-made biological agents alike, companies are investing in the development of improved biosurveillance systems. 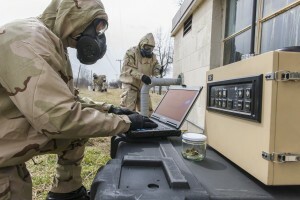 Such systems, ranging from next-generation airborne biodetectors to advanced genomic tests, have several benefits over existing methodologies: They require less manpower and logistics support, have the potential to cover a wider range of organisms, and have the potential to be updated quickly to be prepared for new and evolving threats. Further, when we get to a point where genome-level detection technologies can be routinely used in the field, we will be better able to dissect a biological event to determine, among other questions, whether the event was naturally occurring or a terrorist act. The statutory standard for the approval of medical devices is also decades old. In 1976, the Medical Device Amendments required a “reasonable assurance of safety and effectiveness” based on the “valid scientific evidence” for a medical device. However, how the FDA interprets “valid scientific evidence” can vary greatly and has changed over time. Since medical devices are changing constantly and being updated, there is also a pathway that allows a medical device to come to market based on demonstrating that the new device is “substantially equivalent” to a similar device that is already on the market (known as a “predicate device”). This is referred to as the 510(k) pathway and is reserved for moderate-risk devices. We in the biosurveillance community might be in an ideal position to help speed the adoption of new technologies because we stand at the intersection of two technology trends currently impacting diagnostic testing: the drive for smaller and easier to use technologies that can be used outside the traditional clinical environment; and the drive for quicker medically actionable test results.